Big bouncy curls and a headband that goes across the forehead are a fantastic throwback to 70's glam style. Be the trendsetter at your prom with this vintage hairstyle. Add a modern twist with a rhinestone headband and giant faux flower. Kelly Osbourne looks fabulous in a gorgeous hairstyle perfect for a prom. These old Hollywood glamour curls are elegant and complement a formal gown wonderfully. Try these vintage curls with medium hair for a beautiful touch to your entire ensemble. This half up-half down hairstyle is a beautiful way to show off medium length hair. Curl the entire head of hair and pull the top half of the hair back and secure it with clips or hair pins. This crystal hair pin is an elegant way to dress up your hairstyle for prom! This sleek and straight hairstyle looks fabulous on Emma Stone. Rebel against the slew of roller sets and curling irons, and opt for a chic polished style. This is a great style for naturally straight and fine hair that doesn’t like to hold curls anyway. Add a smoothing serum to the hair and pull a few pieces from the front to the back for completed look. This is an excellent hairstyle for any texture of medium length hair. The sleek braided ponytail is a sophisticated look and can show off a gorgeous set of earrings, and showcase your face. Play around with the braid style – a fishtail braid is also a cute choice! 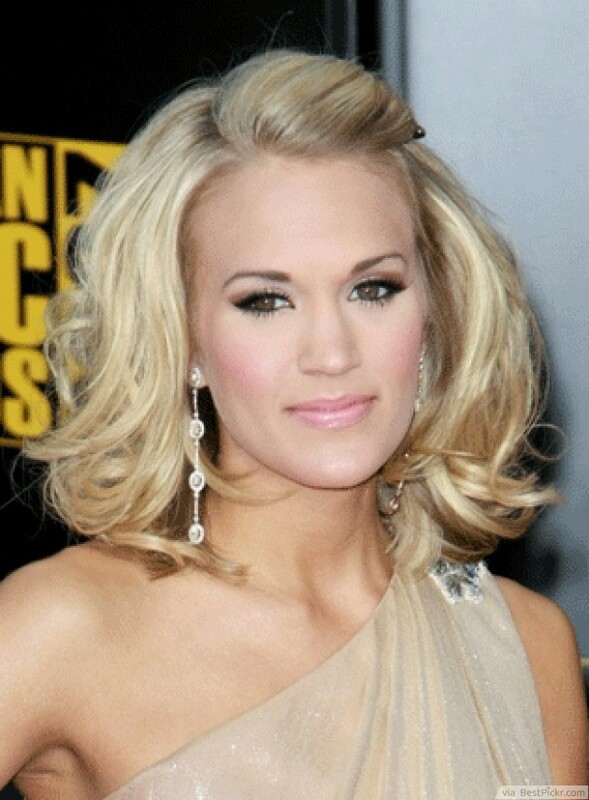 Carrie Underwood looks amazing with this voluminous wavy hairstyle while she had medium length hair. The volume in the waves creates soft texture while the bangs pulled into a bump put a playful twist on things. If you're looking for a beautiful prom style, but don't want to appear overdone, this is the look for you! It's elegant, yet understated. 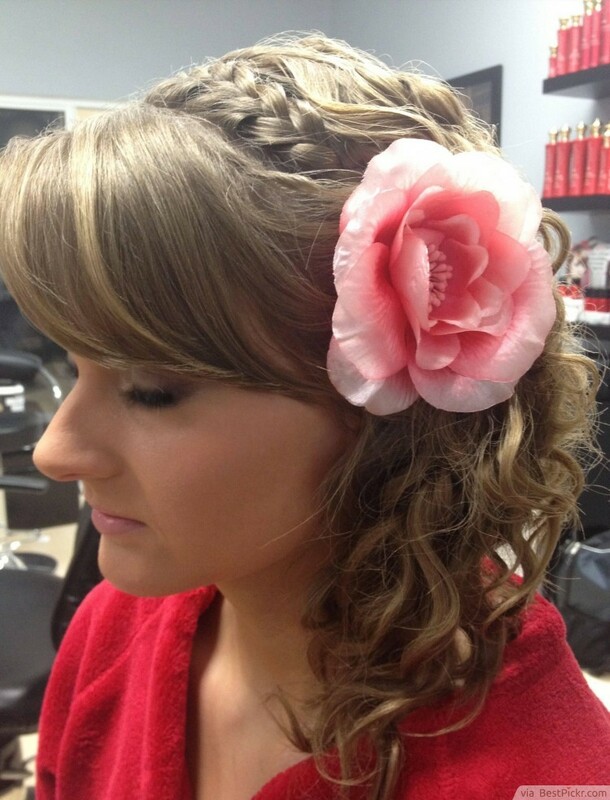 This hairstyle is a lovely medium style for prom. With the rest of the hair curly, keep the bangs smooth for a more polished style. A French braid right behind the bangs is a great way to transition from straight to curly hair while also adding extra interest. Use a flower to secure the braid and to personalize your look! This wavy style is a very pretty and feminine idea for proms. Part your hair unevenly down the center and pull a few pieces back for a carefree look. The large waves look great with medium hair because they don’t get pulled down by the weight of longer hair. Tousled hair is always fun and flirty and that makes it a perfect hairstyle for prom. Add some volumizing mousse to damp hair and blow dry it with a round brush for soft, wind-swept hair. This is a great style for medium hair because even if you leave it down, it wont cover your dress's neckline.